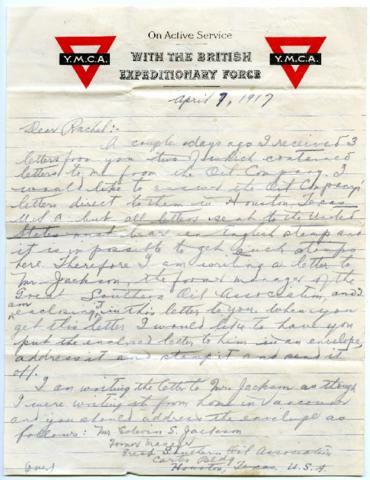 Letter from Private Edward Joseph Seidelman, dated April 7, 1917. (Assumed sent from France) to Rachel Seidelman of Vancouver. In the letter, Private Seidelman talks about the newspapers mentioning General Sir [W.R.] Robertson saying "we lost the mastery of the air" and "asks for 500,000 more men by July". Private Seidelman also states that the United States declared war on "the Huns".